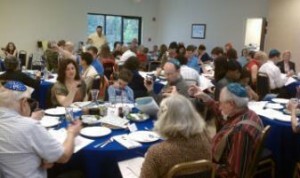 Sha’are Shalom provides learning opportunities for it’s congregants and the greater Southern Maryland community. In addition to Religious School and B’nai Mitzvah training for our members, Sha’are Shalom has weekly Torah Study and holiday celebrations such as Passover and Yom Ha’Shoah (Holocaust Rememberance) that are open to the public. See our calendar for a full list of events.